Organic pasta made with 100% red lentil flour. 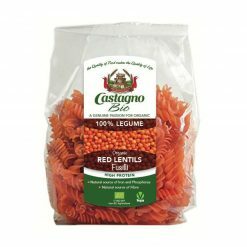 This delicious pasta is made from 100% organic red lentil flour. It contains no cereal, is high in protein, and has more fibre and less carbohydrates than conventional types of pasta. It is also a good source of iron and phosphorus. It is easy and quick to prepare (about six minutes of cooking time) and makes a very attractive meal, both hot and cold. Because of its delicious red lentil taste, it can be enjoyed simply with a bit of olive oil and salt.